About 30% of women who have had a tubal ligation later find themselves wanting to have children. Although tubal ligation surgery is a permanent surgery, these women have two options to get pregnant again. They can have the ligation reversed, restoring their ability to conceive, or they can use in-vitro fertilization (IVF) treatments. Choosing between tubal ligation reversal surgery and IVF can be a difficult choice. 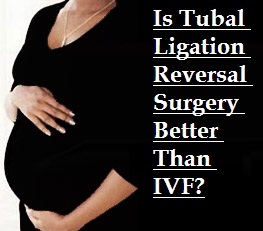 However, when you look at the facts, tubal reversal surgery has more benefits than IVF. The first and foremost benefit of tubal reversal surgery is the higher pregnancy success rates of the surgery over IVF treatments. In recent studies, 82.6% of tubal reversal patients achieved pregnancy after surgery, while only 28.4% of IVF patients achieved pregnancy after treatment. When compared, tubal reversal surgery clearly has higher pregnancy success rates than IVF treatment (82.6% vs 28.4%).*. The second main benefit of tubal reversal surgery is that it is a one-time procedure that allows women to have more than one child after the surgery. After a tubal reversal, a woman has a chance to get pregnant every time she ovulates. IVF treatments are needed for each pregnancy, but a tubal reversal is only needed once. This is great for families who want to have more than one child, which is often the case after having their first! Tubal reversal surgery with Dr. Morice only costs $5,250. The one-time fee includes all pre- and post-operative care, anesthesia, surgical suite fees, and more. IVF, on the other hand, averages around $12,000 per treatment. This can add up quickly if a woman doesn’t get pregnant right away. The risk of having twins following IVF is approximately 30%. There is no known relationship between tubal reversal surgery and an increased rate of multiples. Tubal reversal surgery lasts about 90 minutes and has a recovery time of 5-10 days with mild pain. IVF procedures require weeks of preparation. This includes injections, examinations, and blood tests, all before a woman’s eggs are retrieved and embryos are transferred. Tubal Ligation reversal patients will receive anesthesia for the surgery and may decide take ibuprofen after the procedure. IVF, however, requires 4-6 weeks of injections of medications that can pose serious health risks. Are you or your spouse considering a tubal reversal? Do you want to know more about it? Dr. Morice offers free consultations for women interested in tubal reversal surgery. Call our office at (985) 702-BABY (2229) or email us at drmorice@mybabydoc.com. *While the above success rates are from published studies, success rates vary by each individual patient. As mentioned above, multiple factors affect a woman’s chance of achieving a successful pregnancy after tubal reversal. How Safe is Tubal Reversal Surgery?